One of Canada’s largest licensed weed producers has formed a strategic partnership with a major pharmaceutical company, marking the first — and much anticipated — foray of Big Pharma into the legal cannabis industry. Tilray, which is largely a British Columbia-based company but with headquarters in Toronto, announced early Monday morning that it had signed a binding letter of intent with Sandoz Canada, an affiliate of Sandoz International GmBh, which is part of the Swiss pharma giant Novartis AG. The agreement has two major components to it. First, it will see Tilray leveraging Sandoz’s know-how and internal sales force to educate Canadian pharmacists and physicians about Tilray’s medical cannabis products. Second, Sandoz and Tilray will partner up exclusively to develop new non-combustible cannabis products such as gel caps, edibles and sprays. And depending on future regulatory changes, Sandoz could eventually become the wholesale distributor of Tilray’s medical products to Canadian pharmacies and hospitals. Canada’s medical marijuana market, established in 2013 under the Access to Cannabis for Medical Regulations (ACMPR) regime, has already spawned a billion dollar industry. In the second quarter of 2017 alone, licensed weed producers sold 7,500 kg of cannabis oil products and almost 6,000 kg of dried marijuana. There are roughly 235,000 registered medical cannabis patients and 10,433 medical practitioners nationwide who have at some point, prescribed medical cannabis to patients, according to data from Statistics Canada. Tilray is in essence, enlisting the help of Sandoz Canada to convince physicians that their cannabis products should be the go-to, over hundreds of other products that are currently on the market. “We have an existing sales force of about 10 people that spend a substantial amount of time meeting physicians on a daily basis and educating them about our products. Sandoz has a sales force 10 times that size, which will enable us to scale up that physician education process rapidly,” Kennedy said. Pharmacies in Canada are still not allowed to distribute medical cannabis — the only way one can obtain weed for medical use is through the mail, directly from licensed weed producers. But Canada’s biggest pharmacy chain, Shoppers’ Drug Mart recently applied for a Health Canada license to dispense medical marijuana, a license that is widely expected to be granted. 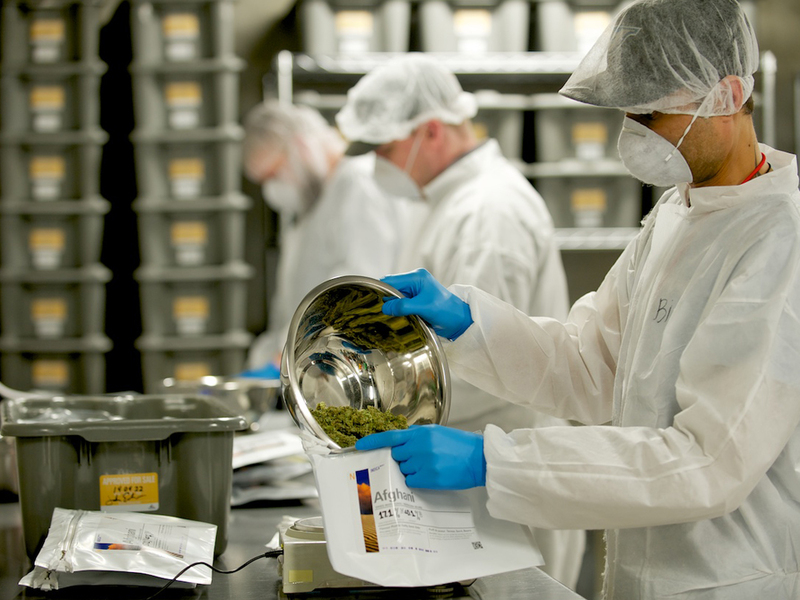 Tilray, for its part has already signed a deal with Shoppers’ to supply medical cannabis products, one of three companies — Aurora and Canopy Growth being the other two — that hope to to stake out their early claim as wholesale distributors. According to Kennedy, Sandoz Canada had spent the last 18 months studying the medical cannabis industry in an attempt to figure out how Big Pharma might fit into the Canadian cannabis landscape. “They were really focused on ethics, quality and compliance practices and were looking for a company the right way. We had our first meeting with them in the summer of 2017,” Kennedy said. To date, global pharmaceutical companies have not shown a keen interest in the cannabis industry — some believe that is due purely to the limited opportunity for patents. “The patent potential of cannabis is restricted to certain formulations, not the kind of products that are currently available through the ACMPR,” said Phillipe Lucas, Tilray’s Vice-President of Patient Research and Advocacy. “In fact, patents in methods of delivery have already been claimed by others,” he added. But Sandoz focuses on generic pharmaceuticals, which might explain their interest in entering the medical weed market. “We perform research on cannabis products for research and development, products that we can’t sell yet but can be used for clinical trials and exported for clinical trials. To Sandoz that gave them tremendous confidence because they saw us as kind of a pharmaceutical company as well,” Kennedy claimed. Tilray exports its products to 10 other countries including Germany, Czech Republic, Australia and New Zealand which have come to view Canada as a safe and reliable source of medical cannabis. In Germany, pharmacies sell medical weed and the government’s universal drug program covers the costs.